A couple months back this house in Washington DC was featured on the Things That Inspire blog and I became immediately enthralled with it. So much so that I began to forward the picture of the house around to friends and family to share it with them and to announce that I had to see it in person. I followed up the emails with a Delta ticket purchase - I was serious about an in person visit and wanted to do so before the weather turned. I wanted to get pictures while all of the landscaping was at its peak. Winter pictures wouldn't be the same. It may seem impetuous to jump on a plane to see a house from a blog, but I find myself more and more compelled to do just that when there are some new (to me) places to do some architectural tourism. I lived in DC about 10 years ago, but that was before my architecture and design interest took off so I hadn't explored all of the rich architecture the city has to offer. After seeing many interesting houses on the Things That Inspire and Architect Design blogs, I knew I'd have plenty to enjoy while there. When I got to DC I took several pictures of the house and it was nothing short of spectacular. However, it was a sun-drenched morning so most of my pictures are over saturated with light and don't do the house justice. All was not lost though. In touring the neighborhood surrounding this house I came across a common thread amongst many of the houses: they incorporate urns in their design. I found that particularly interesting and took numerous photos of the various urns. 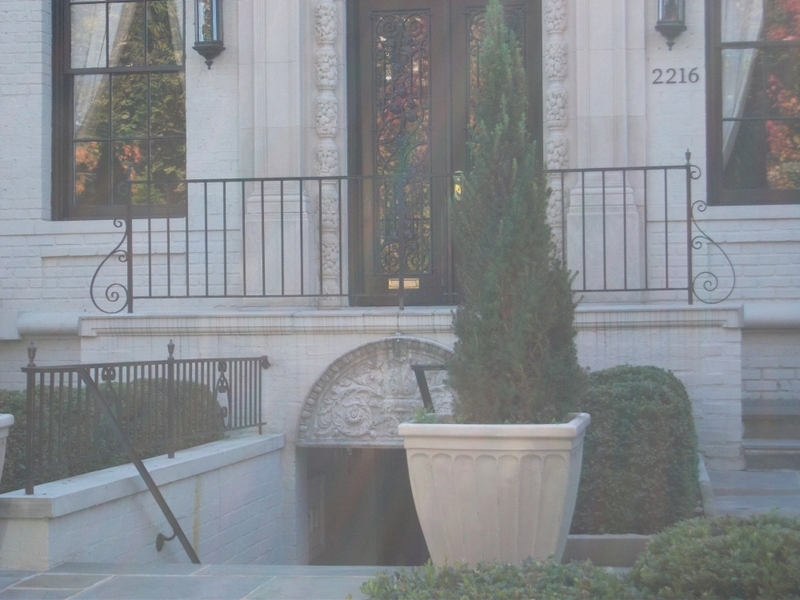 I've always liked urns in architecture and design and I see them regularly in Atlanta. The urns in DC were a bit different though. I'd say more formal. That's natural, I guess, given the formality of the city and the residences they adorn. Many of the residences in this post are for foreign dignitaries. 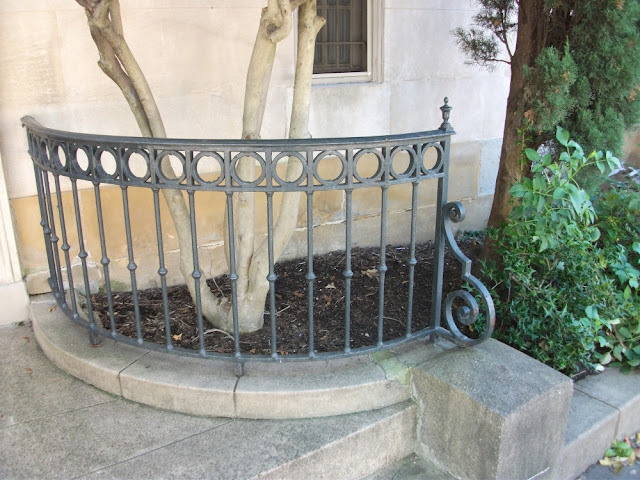 Several of the urns I saw were used as finials on iron railings. I really liked this element. 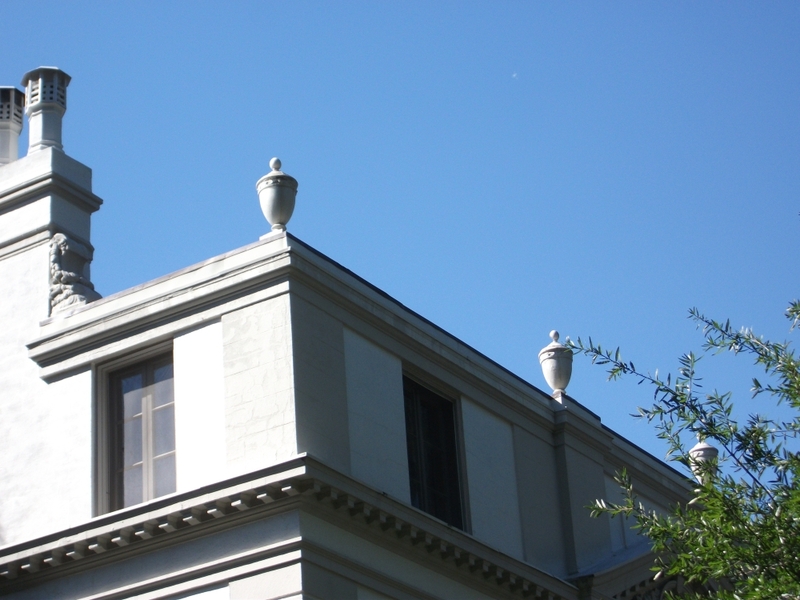 Here you can see multiple urn finials at the house I based my trip on. Another excellent detail is the iron scrolls at either end of the railing. They weren't visible in Holly's photo and were a pleasant surprise when I arrived in person. They remind me of the scrolls regularly seen in McAlpine's designs - often for suspending a copper lantern. Anyone following the Things That Inspire blog will notice several details about this house that have recently been featured on that blog. 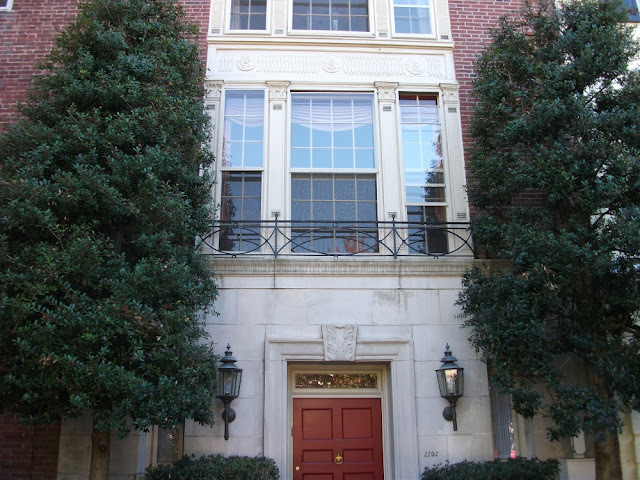 For example, the blue stone that covers all of the walk ways, the limestone door surround, and the painted brick. Everything about this house was executed to perfection. The materials, the landscape, the color palette, etc. I'd love to know who was involved in the design. Another house featuring urn finials on the iron railing. The urn design is similar but different from the urns at the first house. A close up photo illustrates the beauty of this distinguished detail. I like the low sheen of this iron. The closer to matte black, the better in my opinion. I'd have to say this is my favorite urn finial of all that I saw on my trip. 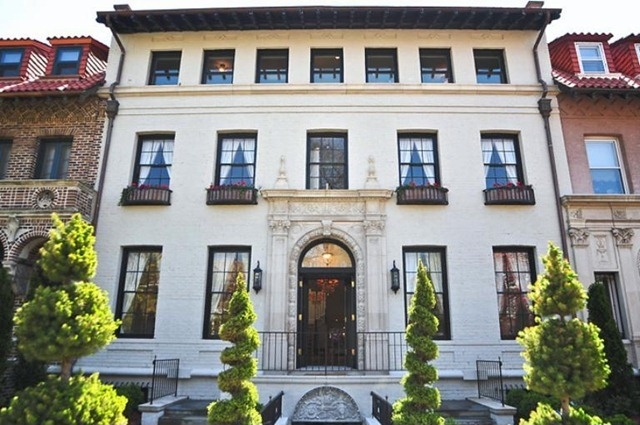 This French-style mansion has been featured on both the Things That Inspire and Architect Design blogs. Notice the large scale urns. They're quite impressive in person. Pictures don't do the size and scale of this home justice. Urns were decorated across the top of this house. I thought it was a unique location for them. Another finial urn on an iron railing. This one is a bit taller and skinnier than the others. The "neck" at the top is also longer. It's interesting to note the differences in each urn, especially given that so many railings have them in the neighborhood. 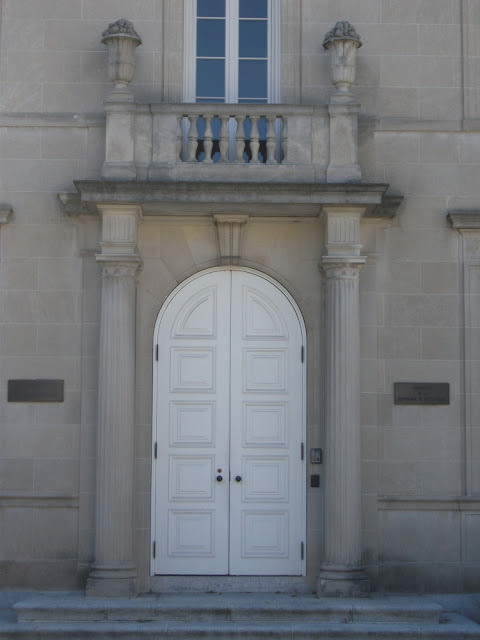 Limestone urns perch above this grand entrance. There is so much to say about this entrance. The urns are only one detail of the amazing composition. 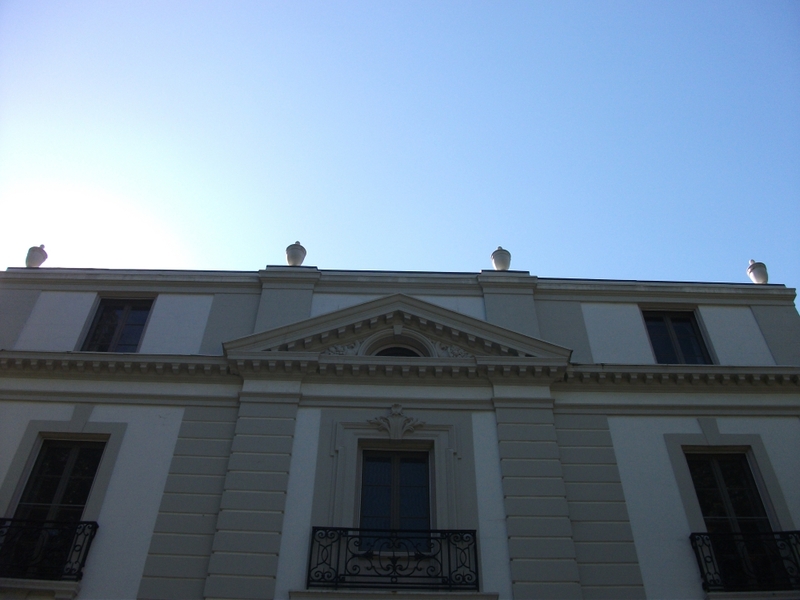 The fluted columns that are round and then become square at the top. The rounded, paneled door. Which, by the way, I'm quite a fan of rounded doors in this type of configuration. They seem to soften the otherwise hard feeling of all the limestone. 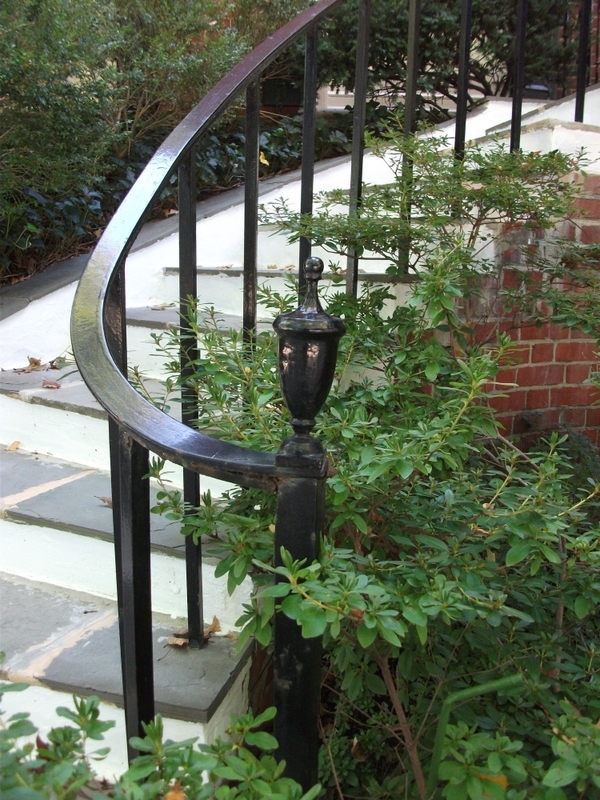 The finial urns make another appearance on the balcony railing of this house. 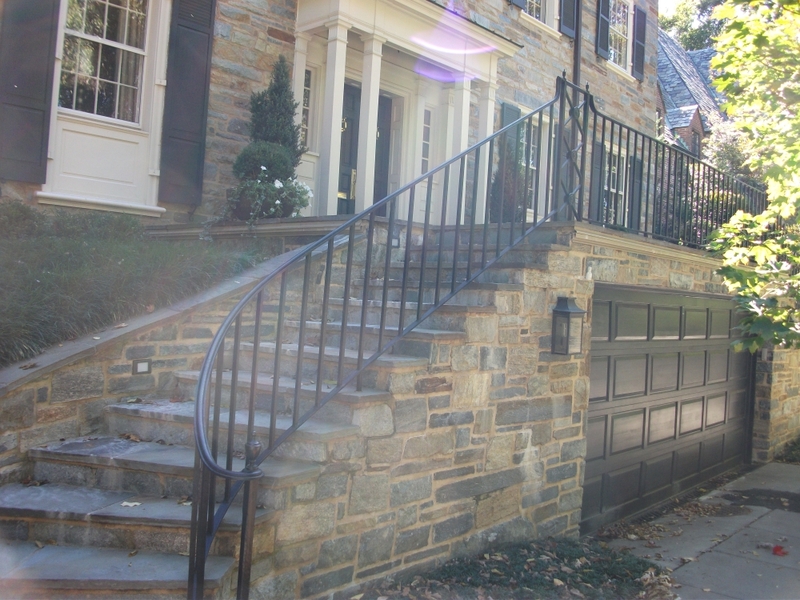 I thought the pattern of the railing was interesting with the oval shapes. It looked very French to me. Clearly the distinct scroll stands out most here, however, the commonplace finial urn is there too. Seeing so many of these finial urns makes me wonder how design standards like this come to be. If I had seen one or two railings with the urns, I would probably have dismissed it. But because I saw them over and over on house after house, there must be something to it. I don't recall ever seeing any finial urns on iron railings in Atlanta so I don't think it's a universal design pattern, but something more locale-specific. Perhaps Stefan from the Architect Design blog can comment. He's a DC-based architect. Last, but not least. 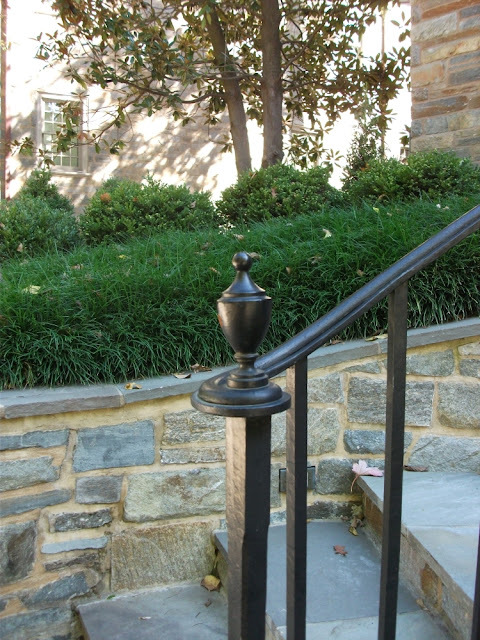 While this house is not located in DC, I couldn't help but include it in this post because of its finial urns on the stair columns. When I saw these urns I was quite taken with them. Such a great detail. For more of this house, see my Perfect English post. Beautiful post and thank you for taking a trip to Washington Dc and showing us the urns, love them! I didn't used to "get" urns but I've changed my ways. Now I'm 24/7/365 urn lover. I'm still pumped about my recent encounter with Shutze's Calhoun House urns. When I was a National Trust intern as a HABS team member measuring the Woodrow Wilson house, I spent my lunch breaks walking around Kalorama and admiring all the fabulous urban houses. 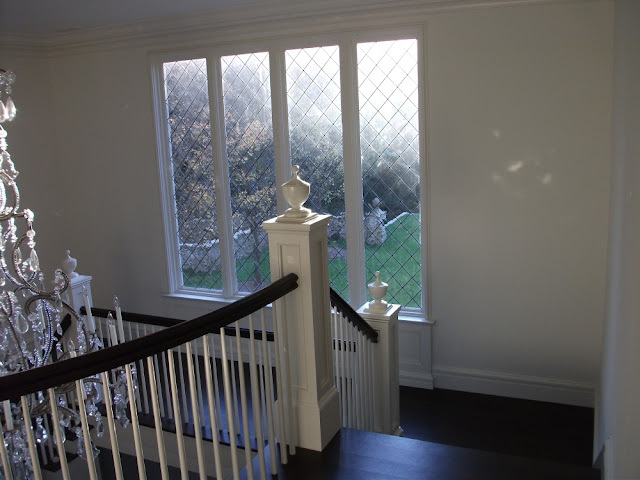 There is a great concentration, not to be missed by anyone interested in traditional residential design. 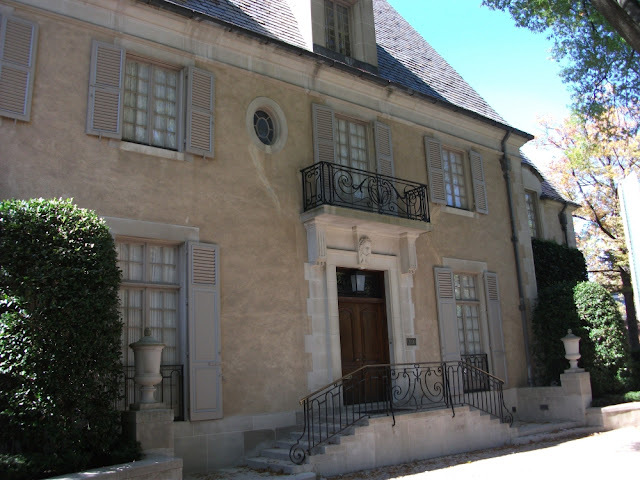 For great Atlanta examples of urns, check out Jane Marsden's at 2300 Peachtree. Just recently found your blog. Stop by to see me sometime. How fun to fly here to D.C. to visit stately homes. There are so many jewels here. I love the topiary spires in the pictures. how did I miss a new post? the urns are an interesting detail to take note of, they really do seem to 'complete' many of these homes. 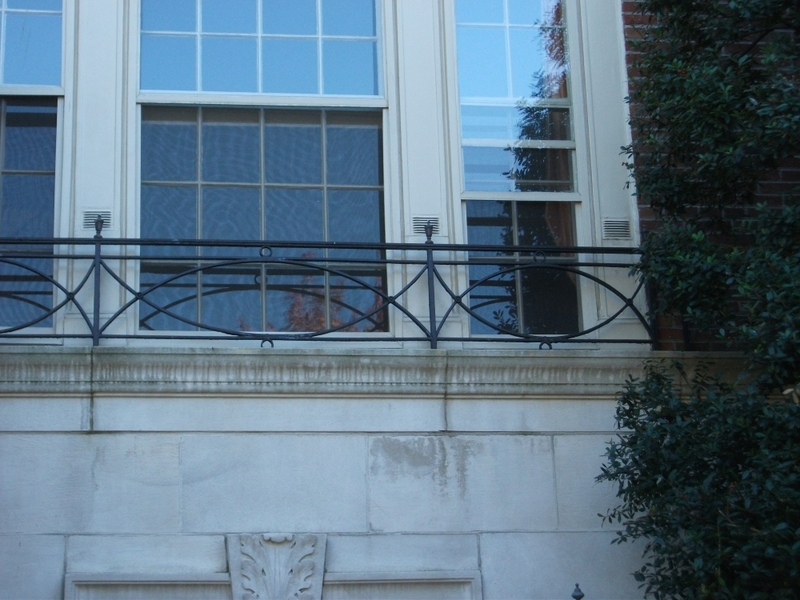 I remember when I was in college at Samford, here in Birmingham, many of the older buildings on campus (which is wholey Georgian Colonial) feature brass urns atop the railing terminations, similar to the exterior stairs you've shown here. Oh My that home is stunning, and love the urns-planters on side framing the home, my utmost favorite..
as im on the hunt..
New follower-ill be back by to see more amzing images.. I missed this post somehow! I have always lusted for urns. They are so grand, and even the poorest gardener such as myself can appear to know what they are doing with urns with just a simple evergreen! James the urns are such a wonderful architectural detail and especially as they can be used in so many ways! Do come and enter my giveaway from Fifi Flowers! Of course what do I notice but all the matching window treatments. They make all the difference to me. Very pretty house for sure! I have always loved urns, bought some for my front door recently. I like your eye for detail. How fun to go and see your dream homes! Personally I love urns..always have and always find ways to incorporate them inside of the house asd well as outside. Love those pictures, they sure don't make them like they use to. Please if you have a minute check out my new blog, we are building our own dream house and I am talking about it through my blog as well as sharing my design and decor loves. Thanks! I really enjoy your blog. You may like to check it out because I had so much fun doing it. It's got a bit of everything fashion, interiors, food, travel spots - hopefully you will find something in there that you like. Great article , i really liked all these precious info , Thanks very much for this amazing article.